Does not include bins. See page 201 to order bins. See page 259 for details. See page 245 for details. Can be positioned along conveyor runs for access to parts. Extruded aluminum construction. 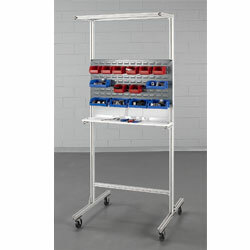 Includes 8"D shelf, 36"W x 19"H bin panel, and framework for optional light or tool balancer. FOB WISCONSIN. XA-1401 10" shelf (replaces standard 8" shelf)	 Wt. 5 lbs. XA-1402 12" shelf (replaces standard 8" shelf)	 Wt. 6 lbs. XA-1403 Tool balancer, 12 lb. capacity	 Wt. 9 lbs. XA-1404 Tool balancer, 25 lb. capacity	 Wt. 9 lbs. XA-1405 48"L fluorescent light	 Wt. 8 lbs.